2009-06-14: Please don't visit clix.to/sbsp anymore. Apparently, as of April 30, Bravenet stopped offering their short URL redirect feature and neglected to inform me. The best ways to get to my page are by typing umich.edu/~goodwins/bob into your browser's address bar, Googling (or Binging, if you so choose) for Sarah's Spongebob Site/Shrine, or bookmarking me (Firefox users, press Ctrl+D). 2008-12-04: There won't be too many future changes to this site. For the latest Spongebob updates, please visit SpongeBuddy Mania and United SpongeBob. Also, Wikipedia's Spongebob page generally has accurate information. Thank you to everyone who has supported my site over the many years! =) Please contact me if you have any questions about the site or Spongebob in general, and I'll do my best to respond. Lyrics are under "music" in the menu at left. ¡Tengo letras españolas! ¿Te gustaría contactarme? I don't have any full episode downloads. If you want to see all the episodes, it is difficult to find them online. Viacom monitors YouTube so that people's uploaded episodes are not posted for very long. Your best bets are to purchase the DVDs or record the show from TV (it's on numerous times per week - check your local TV listings). Use TVGuide.com to find out which episode titles will air (you may need to register, input your ZIP code, and select the type of TV service you have). In the U.S., half-hour episodes air on Nickelodeon and also the premium cable channel Nicktoons Network (formerly "Nicktoons TV"). Nickelodeon's "seasons" are not one full calendar year each, nor does the channel air new episodes on a regular basis. Although Spongebob Squarepants has been on the air since 1999, there has not been one season of the show per year. 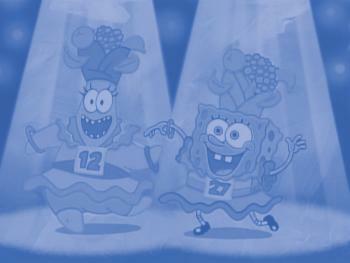 The Spongebob production team took a break in order to work on the movie, which premiered in 2004. Well, this beloved site of mine has been relocated a few times. Don't go to buzhwa.com, liquid2k.com/buzhwa, jellyfishing.net, or clix.to/sbsp anymore; they won't work. You can reach this main page of my site via umich.edu/~goodwins/bob. This layout premiered on February 29, 2004. TooMuchFilth made the sweet image along the left margin and some link buttons too, and Foxy Grandpa provided hex codes for the colors. The sidebar image is an altered part of a screenshot from the episode Texas. The font used for the headings and navigation is Dauphin.